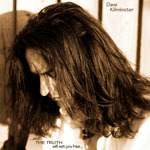 Share the post "Album review: DAVE KILMINSTER – …And The Truth Will Set You Free"
The common denominator in Dave Kilminster’s recent albums may be that they seem to appear at GRTR! Towers towards the end of the year and therefore are easy to overlook in the Christmas fug. That aside, Dave is a consummate professional and each solo sortie repays the listener with his honed and often understated guitar, well produced songs, added strings, and an overall cool West Coast vibe. This is nowhere more apparent than on ‘Circles’ which reminds of an earlier Robben Ford in its gently funky undertow before bristling with Kilminster’s tasteful guitar figures. His approach also reminds me (again) of Jakko Jakszyk’s solo work (vocally at least). Some commentators will inevitably point towards Pink Floyd and – whilst you might expect that given his CV – thankfully he doesn’t ape Gilmour or indeed the other Dave’s band. Dave’s pedigree is impressive, he was the first winner of the Guitarist magazine ‘Guitarist Of The Year’ award that has witnessed such luminaries as Simon McBride and since that time has been a mainstay in Roger Waters’ live band. On a slightly more humble if no less significant level he also contributed to Heather Findlay’s live work and album and in 2013 released a collaborative effort of cover versions with Murray Hockridge. Back to the album and there’s a lot to like, whether it’s ‘Messiah’ with its sub-Neil Young riffing highlighted by Kilminster’s vocal harmonies and The Larkin Quartet’s strings. The bluesy ‘Addict’ gives way to the heavier ‘Thieves’ whilst ‘Save Me’ is driven by acoustic guitar and more reflective, enhanced again by his string arrangements. The closer ‘Stardust’ is led throughout by a hypnotic, chiming, motif with Kilminster exercising his usual restraint in its bluesy coda. This entry was posted in ALBUM REVIEWS, ALBUM REVIEWS (Mobile), All Posts and tagged album, And The Truth Will Set You Free, Dave Kilminster, guitar, guitarist, Keith Emerson, review, rock, Roger Waters. Bookmark the permalink.